Let’s hope that the ideal of being a gentleman has not gone extinct too. Much was lost this year. 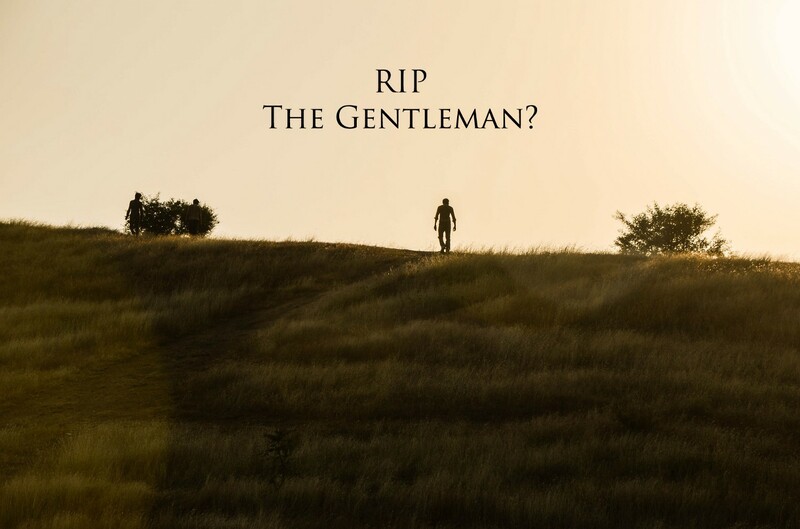 Let us hope that the ideal of being a gentleman has not gone extinct too. The gentleman is honest, kind and strong in character. His actions show a deep respect for women and care for all. He looks people in the eye and welcomes them into the moment with genuine warmth. He is courteous, so he does not lash out like a child, call others bad names, say crude things, stew rumor, or minimize others. He issues no fake gestures and promises, does no pandering for position and popularity. He is centered and real and so he is disarming; he creates the safety in which others freely speak and learn and be. He is generous in giving time and praise. His duty is above self-promotion, so in his presence others are empowered to rise and lead. He is stoically loyal in relationships but wildly independent in thought. His opinion is formed slowly, built on the foundation of listening and careful study. He admits his wrongs and in doing so does not seek to make the other wrong. He is quick to forgive. He does not incite the crowd with anger simply because he can. He can stare into the abyss of fear and intolerance and not be consumed because he recognizes his own weaknesses, sees good in others, and trusts the better angels of our nature shall prevail. He has humility; he is above no one but his own weaker self. He does not turn his nose at words that sound like work: discipline, duty, dedication, devotion. For this, he is distinguished among men. Yet he is rarely boastful except in celebrating others. He is comfortable with himself and finds pleasure in simple things and wit in all occasions. He faces adversity with dignity and boldness. He has the good sense to know when to quit and avoid a needless fight and still the spirit to be committed and firm when moral influence is needed. In the steady manner in which he faces all challenge, he inspires others to be thoughtful, to believe in their own powers, to persevere. His good manners make him a welcomed guest. His reverence for life makes him a cherished friend. His example is rare. But it is needed. So let us celebrate him. Let us resurrect him in our time of mean obliviousness. Let us ask who in the new generation will carry the torch of the Gentleman. Which are the best qualities in gentle man?